one // Cooler temperatures are just around the corner, which means I’ll be pulling out the cozy sweaters. This year I can’t seem to get enough of the slightly oversized pullover styles…so easy to throw on with jeans, and effortless cool. This one is particularly soft, and comes in some great Fall colors. two // Nothing says Fall like the perfect plaid scarf…and this one is the epitome of perfect plaid scarf. If you prefer a little less volume in your scarves, this one is a great choice. And it’s only $25, so it’s kind of a one-for-you, one-for-me deal! three // Cognac is usually my go-to color for handbags this time of year, but I’m having a little love-affair with all things oxblood. Especially paired with pale pink! #swoon This mixed material cross body has a fun tassel, but it’s the rich color that will add so much to all your Fall outfits. #itstotallyneutral Find a similar one here and here. Speaking of scarves, this popular fringe infinity scarf is back, this time in 6 great colors and under $20! (See it in-person in my last Dressing Room Diaries.) And if you follow my Sugarplum Style series, then you know I live in the hoop earrings…so I’m kind of obsessed with these double hoops for only $15! next article: One Room Challenge Time! A 20% chance of rain is enough for me to throw on my Hunter boots! I love them so! I'm loving blush and oxblood right now, too! And if I had rain boots, I love your hunter sock trick! Sneaky cool hunter sock trick! And I think it's about darn time you re-named "five under 50" to "Finds under 50". Then you can add as many great finds as you (and we) want. Oh boy! More is always better. Just like desserts. Thanks so much for your sweet words on yesterday’s post! I know it was family overload, but I love having a scrapbook of our life on this blog, as well as home and style inspiration, so thank you for indulging me! one // Cooler temperatures are just around the corner, which means I’ll be pulling out the lighter cardigans & jackets. This three-quarter sleeve cardigan comes in 15 great colors, and is available in both regular and petite sizing. It’s insanely versatile and easily pairs with jeans, dresses, skirts & trousers! two // This stylish tote is reversible, so it’s like two-in-one! It also comes with a coordinating wristlet, so it’s two-for-one! Hello, bang for your buck!! It’s big enough to stash all your stuff, including a laptop, so it’s as functional as it is stylish. three // Our home decor is pretty consistent year-round, but when Fall comes, I do love to bring in cozy throws and pillows with lots of texture, like this gray lumbar kilm. This velvet ikat in deep jewel tones is gorgeous, too. four // If I’m at home, I’m almost always in pajamas. Even if it’s just for a few hours between errands, I’ll change back into pajamas. It’s partially because I don’t like being in street clothes while laying around the house #freakalert, but mostly because I love getting comfy. So you’d think I’d have a whole collection of cute pajamas…after all, it’s what my family sees me in most of the time, right?! Um, no. Quite the opposite actually. I figure it’s time to change that..starting with this Sporty Spice set. five // Going along with that whole comfy theme, I spend a fair amount of time in leggings in the Fall and Winter. But finding tops to cover the lady bits, while not looking like a mumu isn’t easy. I think we may have a winner with this striped number…hopefully I’ll share it in the next Dressing Room Diaries. 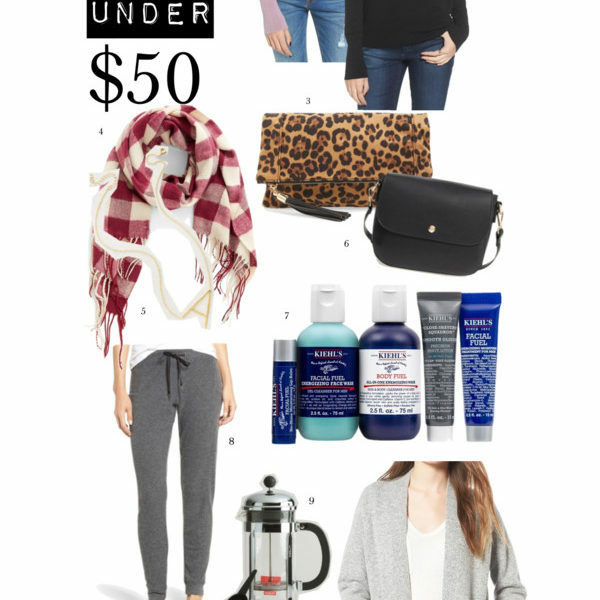 Speaking of leggings, my all-time favorites are under $50, so I should have added them! I wanted to add this v-neck pullover and this twist-front shirt to the list, as well, but Eight Under $50 doesn’t have the same ring to it! What great deals have you found lately? I've been eyeing THESE pajamas! Not warm enough here yet, but I love them. The pajamas are super cute! Thought I was the only one with the street clothes issue. As a teacher, I always change out of work clothes as soon as I get home and usually straight into pjs! Thanks for all of the great ideas for fall. Those pj's are SUPER cute!!!! Love everything! I want to curl up on the couch with those pjs and pillows! I just found a comfy tee shirt dress by Michelle Commune (think that is right) that feels like pjs and dresses up so cute! No pockets but it has stripes! I adore the idea of leggings, but have really shied away from them because my legs are heavier (a bit past "athletic" at the moment). Any suggestions for someone who wants to be comfortable but not look like a slob?? I blog from home but work with wine (doing tastings in stores) for my PT gig…. Not lots of need for dressing up too much. Help? Thoughts? That tunic and those pajamas!!! I'm all about the comfy clothes! For those of you who love leggings and struggle to find cute tops to wear with them, check out LuLaRoe clothes! It's a direct sales company so you have to find a consultant, but their clothes are amazing. Super soft and flattering. I've never been into clothes or fashion until I discovered that brand! I'm always in pjs too when I get home! I thought I was the only weirdo!!! lol! I love your blog! Keep up the great work! one // The only thing that makes the end of Summer more bearable, is the fact that boots & sweaters are around the corner. I love a big, slouchy cardigan, and this one takes it one step further by adding deep pockets. It comes in four great neutral colors, and would be cute layered over a plaid shirt or basic tee. This similar one looks super cozy, too. 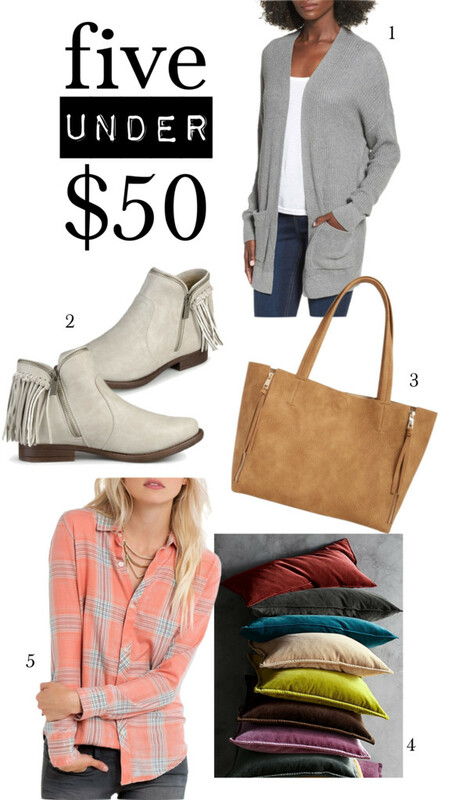 two // I fell hard for some fringe booties last year, but didn’t want to make the investment because I wasn’t sure how long the trend would last. Well, it looks like it’s here to stay, but regardless, this affordable pair won’t break your budget. four // We don’t change up our decor too much for each season, but I do love to swap out pillows & throws. I love these rich, jewel tones, and the velvet is so soft for lounging. 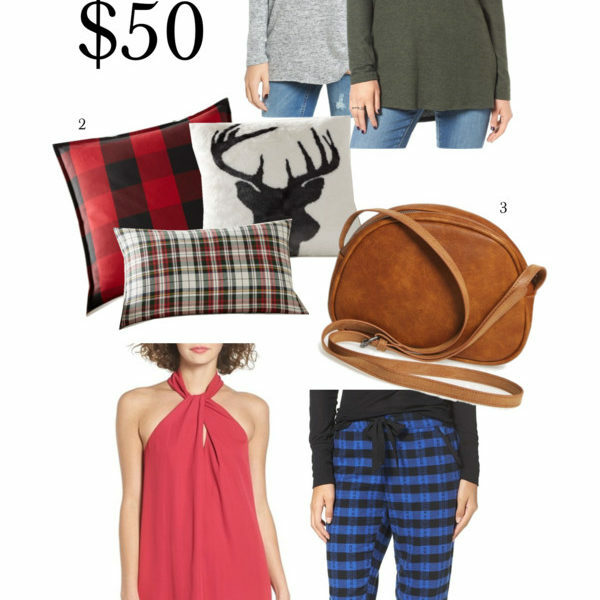 five // I’m a sucker for plaids…but especially those in feminine colors & patterns. I ordered this one, and am hoping it’s as cozy as it is cute! 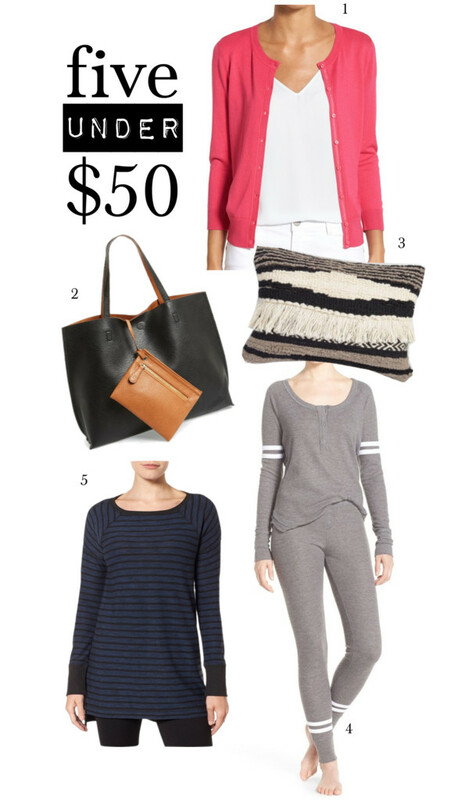 I wanted to add this striped tank dress and this striped pullover to the list, but Seven Under $50 doesn’t have the same ring to it! And with the sale price, you could get all three colors of this top for less than $50! What great deals have you found lately? I love summer, but this year it has been so hot I would say I'm not too sad to see fall arrive. I'm a person that carries a cardigan around all year to restaurants and airports anyway so I love when I see them for a good price. LOVE those velvet pillows!!!! And that cardigan! I have that side slit top and just wear it to pieces!! I haven't seen them in person yet, but so far I like the looks of them! Definitely not long-term shoes, but cute for a trend! I'll check them out next time I'm at Target! I just ordered the striped sleeveless top (mentioned at the bottom of your post) for $13.65. Good find! I've already got the bag.., just waiting for the temps to cool down so I can start to carry it! Obviously I spend a obscene fair amount of time online, so new finds are always catching my eye. Especially the great deals! 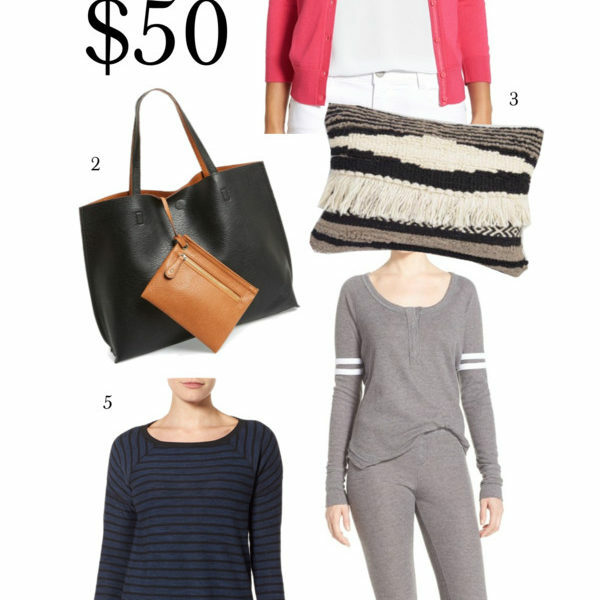 Here are five darling pieces I’m loving lately, and all under $50! one // This little embroidered number is already on the way to me, and I’ve got my fingers crossed it’s as cute in person as it appears to be online! With all that embroidery, you’d never guess it’s under $50, right!? I’m a sucker for this style of dress, especially on hot Summer days. Update: Dang, that sold out fast! But look at the back of this darling option! two // These sneakers aren’t new to me, as I’ve barely taken them off since buying last month. You saw me traipsing all over Provence in them, and in half my recent Sugarplum Style posts. I wear them comfortably with no socks, but do recommend sizing down one-half size. Even my mom wears them in red! I love the slip-on style, and cute no-tie laces. three // This was my favorite cross body bag all Fall and Winter (see it here), but it sold out in a heartbeat. I was pretty excited to share it’s finally restocked, in both the cognac and black! four // Do you stock up on good tanks and tees? I tend to find a style I like, and buy it up in all the colors. This loose tank looks like a good ‘un…and with this sale price, it’s actually 2 for $50! five // Black and white stripes on a pillow…need I say more?! I wanted to add these linen shorts to the list, but Six Under $50 doesn’t have the same ring to it! What great deals have you found lately? 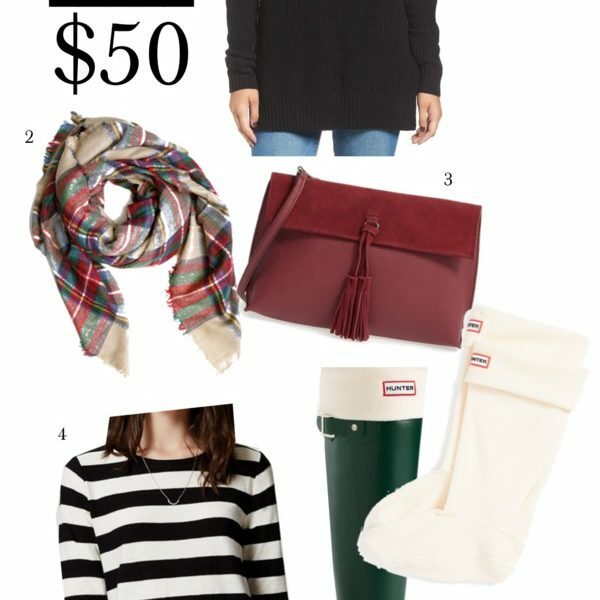 For more posts like these, check out my Look for Less and I Spy series, as well as more Five Under $50. Cassie..I must say I adore your style! I don't think there is one item that you share that I don't like! I just now had a chuckle about your comment about when you find an item you like, that you will buy up several in different colours. My daughter gets so mad at me because I always do that as well. Usually they are timeless pieces that never go out of style. I know I will get my wear out of them and it's better to be safe than sorry, because next year, the store may stop carrying them. Right? Would you show/teach us how you tie a knot in your shirts without stretching them out? I picked up those Converse last Spring and never would have imagined how often I would wear them. They do not leave my feet often. My Chuck Taylors just arrived today — I'm in love! Waiting for my pineapple shirt and white embroidered dress to arrive any day now. I'm certainly nowhere near your size, but your lovely style still works for me! so look for it to pop up in a Dressing Room Diaries soon. think I even own black sandals, since my tan ones go with literally everything! These classic slides look way more expensive than $50, right?! behind it, but basically it draws out impurities & cleans-up pores. Literally after one use! My son uses it as a spot-treatment on his teenager-skin, and has seen a big improvement, too. up the entire Otomi collection! It just adds so much fun & personality to a space. five // No question I have a weakness for (affordable) handbags, with clutches being my main addiction. They just have a way of transforming an outfit, plus, pack away so easily. I recently added this one to my collection (more colors available here), and I can’t believe how much it holds! Not to mention, you’d never guess it’s not real leather! I wanted to add this perfect tee (which is actually 2 for $50) to the list, but Six Under $50 doesn’t have the same ring to it! What great deals have you found lately? 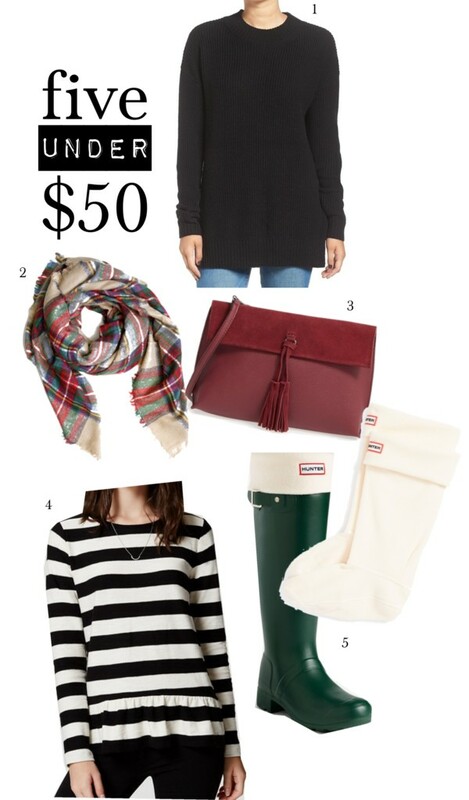 For more posts like these, check out my Look for Less and I Spy series, as well as more Five Under $50. P.S. Happy birthday to my darling sister, the prettiest bride I’ve ever seen! I need those sandals! Like yesterday! Love the pillow! Where is it from? Links didn't work for me. I love that dress!! Old Navy has their jersey swing dresses on sale for $13.50 right now. They fit great and are very versatile. Wow, that's a crazy-good price!!! I ordered the blue and pink and received them yesterday. Loved them so much I decided to order the black and orange as well. There's an additional 20% off so I just got them for $10 each!!! Just ordered the blue dress! Such a great price I couldn't resist! Speaking of Old Navy, I spotted these sandals for $20 today that are super similar to the Steve Maddens. And Old Navy is 40% off everything right now, plus free shipping no minimum! In case anyone is interested! hmmm, all the dresses are are lovely. My choice would be #3 the pink floral or #4 the white dress. add so much punch! See for yourself in my One Jacket | Three Ways post. two of these darling pink flamingo outdoor pillows. even thrown over your swimsuit this Summer. And it comes in 8 great colors, plus a stripe. Fit Tip: I’d size up one for a little extra length. I wanted to add this split-back blouse, but Six Under $50 doesn’t have the same ring to it! What great deals have you found lately? 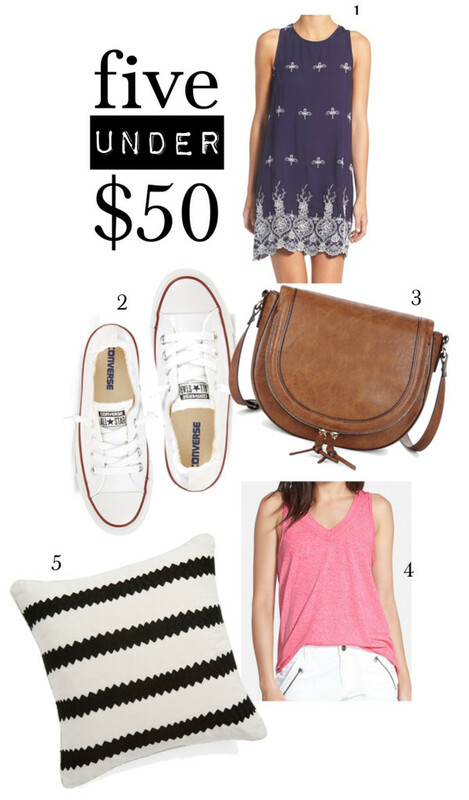 For more posts like these, check out my Look for Less and I Spy series, as well as more Five Under $50. Pink, turquoise and stripes oh my! Love everything! I have that necklace and I absolutely adore it – could wear it every single day! Love your style posts so much!!!! Love it all and how they all coordinate! Great finds. I just returned the bobeau mock neck top because when turned down the points on the back of the mock neck stuck out… Does yours do that or did I get a dud? I've considered reordering. The fabric and fit was perfect! Hmmmm, I didn't notice anything like that? My mom literally has all three colors, and said she didn't notice either. Maybe you got a dud, or it just needed laundering. Yeah, that tassel necklace is soooooooooooo good. Love all the picks! Love that striped bag! Also, I'm curious about what you would consider acceptable pool weather. I just googled the weather forecast for Dallas #isthatweird and today is supposed to be 29C, which I believe is about 85F. Do you consider this to be cold? I can't imagine having to function somewhere with those sorts of daily temps. I would never get anything done. Every day would be pool day for me in Dallas. And I think I'd be totally fine with that!! I second that mock top- have it in polka dots!! one // I’m a racerback dress junkie…in fact, I have this one in three colors! two // I’ve never met a stripe I didn’t love, and this fun clutch would pair perfectly with virtually every Spring and Summer outfit. It’s also big enough to carry all your daily essentials. I recently picked up this pair & can’t believe how much I love them. 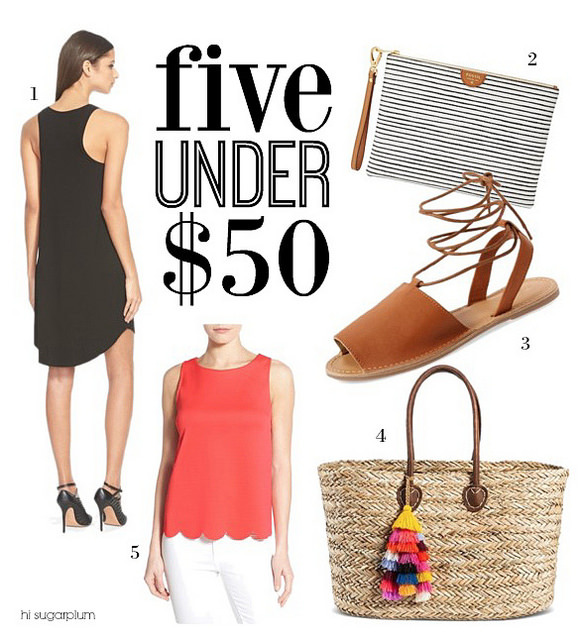 five // I live in basic tees & tanks during warmer months, and the scalloped hem of this one steps it up a notch. So cute paired with shorts or jeans…and those lace-up sandals! 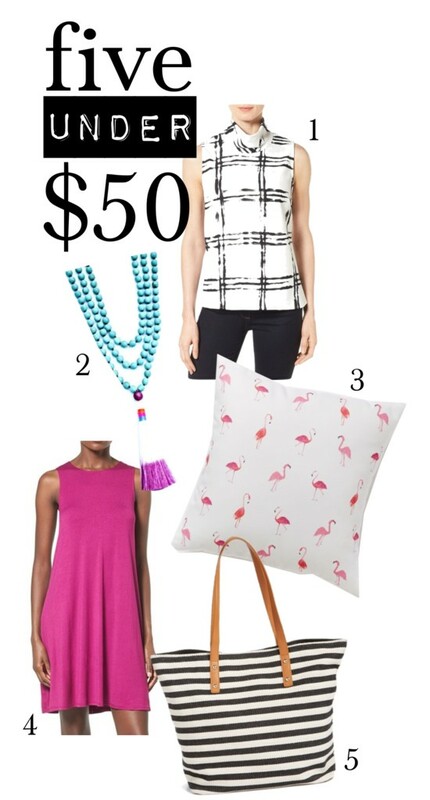 I also love that all five of these pieces are timeless classics, not throw-away trends…and actually make a pretty darling outfit when paired together! What great deals have you found lately? For more posts like these, check out my Look for Less and I Spy series. I flipped when I saw that tote at Tarjay while visiting my College Girl. I did a blog post about it last week even. I need this clutch!! Love it!